Anyone who has taken a photo in a poorly lit restaurant or dim concert venue knows all too well the grainy, fuzzy outcomes of low-light imaging. Scientists trying to take images of biological specimens encounter the same issue because they tend to work in low light to avoid damaging delicate samples. The resulting grainy images can make it hard to distinguish the intricate proteins and internal structures they are trying to study. 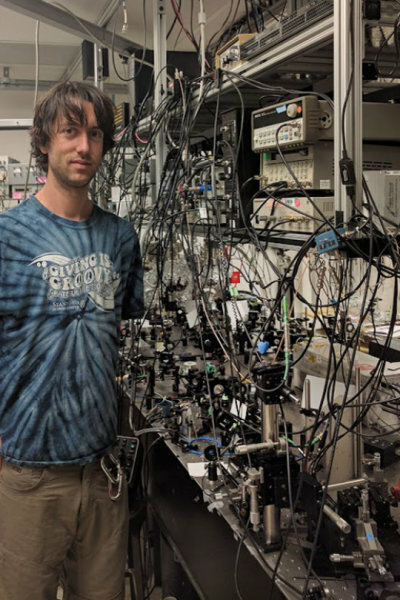 Stanford graduate student Brannon Klopfer helped develop the multi-pass microscope described in the current edition of Nature Communications. The effect that causes grainy images of either your meal or a biological sample is called shot noise. Stanford researchers may have come up with an elegant solution to this problem, which they refer to as “multi-pass microscopy.” This technique, detailed in a Sept. 27 paper in Nature Communications, could make it possible to view proteins and living cells in greater clarity than ever before. In optical microscopy, individual units of light, called photons, strike a detector to make the image. The researchers have found they get better results if each photon interacts with the sample multiple times, even in low light. To implement this in a microscope, instead of sending light through a specimen and then directly capturing the resulting image, the Stanford team repeatedly reflects the image back onto the specimen. Multi-pass microscopy is not the only approach to overcoming the shot-noise limit. Another method, called quantum microscopy, uses entangled photons to achieve the same result, but it is more challenging to carry out. The ability of entangled photons to give information about each other means that quantum microscopy can produce higher-quality images compared to standard microscopy. At present, multi-pass microscopy has the potential to create comparably enhanced results with the added benefit of requiring less arduous preparation than quantum microscopy. Multi-pass microscopy could boost more than just low-light imaging because it acts as a general signal-enhancing technique. The method can increase the sensitivity of various microscopy techniques, so long as a source of image noise doesn’t build up with the recycling of photons. “While multi-passing builds up the signal in your image, the noise is hardly affected,” Klopfer said. At present, multi-passing is restricted to optical microscopes.But the team at Stanford is also working on multi-pass electron microscopy, where damage prevents the atomic-scale imaging of single proteins or DNA. Recycling the electrons in electron microscopy would improve image quality just as the recycling of photons does in the optical microscopes.